The Southern Piedmont Woodturners Association leases a large space here at ClearWater Artist Studios (Studio 122), and has about 65 local members. See their Artist Page on this site for images; and/or their own website for more info. The club meets every 3rd Tuesday evening and non-members are welcome to attend the first time for free. Each Month's Featured Demonstrator description will be uploaded to this space, as soon as received from the SPW Club's scheduler for that month. 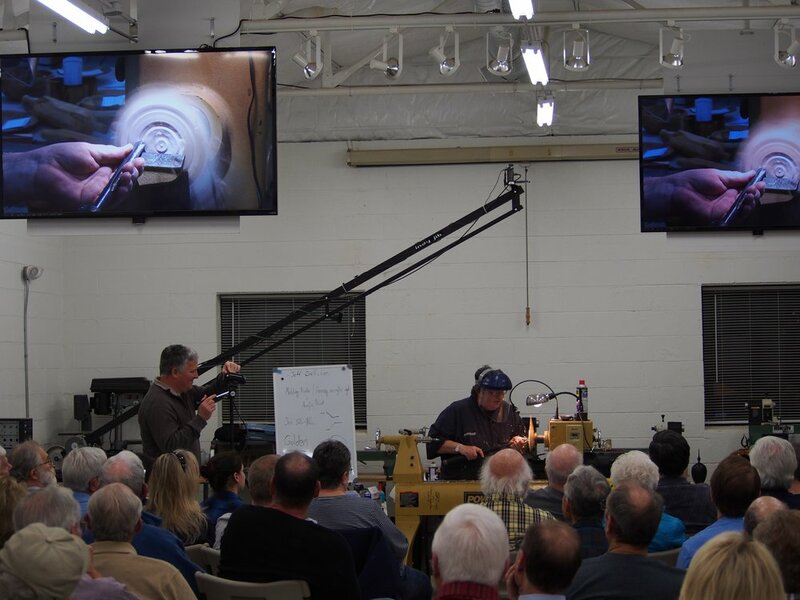 Sometimes there will be a workshop with multiple lathes in use. Check back if details for a particular date aren't yet loaded! Note-- Official meet time starts at 6:30; but social hour starts at 5:30 so come early! Michael Gibson: Michael was a featured demonstrator at the American Association of Woodturners International Symposium in 2013 and received high honors as recipients of the “Award of Excellence” for one of his pieces. At the 2015 International Symposium he was awarded "Master Choice" in the Merging Exhibition. He demonstrated at the 2016 AAW International Symposium in Atlanta, and was awarded "Peoples Choice" for his piece in the exhibition Turning 30. He has demonstrated for numerous chapters of the AAW and has been feature demonstrator in several States symposiums. Michael is in high demand as a teacher and his wonderful techniques are taught to students from around the world. During the last several years he has taught in Canada, Norway, England, Turkey, and New Zealand as well as throughout the United States. He has taught in workshops, chapter classrooms and in private settings. His work has been published in many journals nationally and internationally. The artwork created has garnered the attention of many collectors and has been included in corporate and private collections. His work is sought after by high end galleries and gift shops throughout the world. Over the next year we are planning several teaching/workshop sessions to teach a wide array of turning skills from how to select the wood to make a particular object, to how to sharpen tools, to make particular cuts to achieve a special effect and how to apply finishes to get the final look that makes the piece especially attractive. Keep an eye on our plans as they develop. Southern Piedmont Woodturners begin to gather at 5:30 pm at their studio at the corner of Kerr and Crowell, Concord, NC. The actual evening is about 2 hours, including a brief announcement period, raffle, review of member turned pieces and snacks, winding up about 9:00 pm. Visitors are always welcome! To inquire about club activities, see the club website and find contact info there. Or, you may always call the ClearWater Artist Studios Manager, Sarah Gay at 704-784-9535 who can help assess who best to talk to. A typical monthly meeting with demonstrator showing a technique of interest.